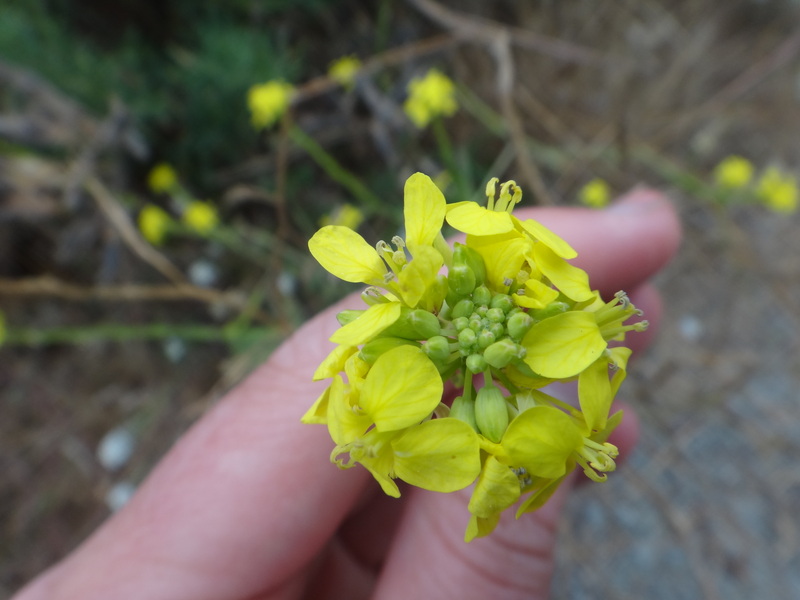 Jeanne turns her frustration with caterpillars in her garden into an exploration of the botany behind an extraordinary species: Brassica oleracea. White cabbage butterflies (Lepidoptera: Pieris rapae) decimated the fall kale crop in our garden. To be fair, the abundant green caterpillars did not consume the entire blade of every leaf. The remaining nibbled leaves, however, in my husband’s view, no longer resembled food so much as a caterpillar farm that would be tedious to turn into food. He ripped out the caterpillar farm, threw it on the compost bin, and replaced it with lettuce. Unlike kale, which is in the mustard family (Brassicaceae), lettuce is in the sunflower family (Asteraceae) and is therefore not even remotely attractive to white cabbage butterflies. I was tempted to save the hole-riddled leaves from their compost fate, in part because I know that the munching of the caterpillars actually increased the foliar concentration of some of the compounds that contribute to kale’s nutritious reputation, and also because plummeting autumn temperatures impart an extraordinary sweetness to kale and the other cruciferous vegetables that are all actually varieties of the same species, Brassica oleracea: cauliflower, cabbage, kohlrabi, Brussels sprouts, Chinese broccoli, and collard greens. The details of the chemical consequences of caterpillar consumption will soon get a post all their own. This post is dedicated to the botany and evolutionary biology behind the amazing diversity of B. oleracea. In his On the Origin of Species by Means of Natural Selection, Charles Darwin drew parallels between natural selection in the wild and the plant and animal breeding orchestrated by farmers, a practice encompassed by what biologists call “artificial selection”: “If man can by patience select variations useful to him, why…should not variations useful to nature’s living products often arise, and be preserved and selected?” Natural selection is what is commonly thought of as “the survival of the fittest”: the disproportionate survival and reproductive success of some individuals in a population, often those whose particular characteristics make them better suited to their environment than their less fortunate brethren. The “environment” in this context encompasses not only the abiotic conditions experienced by an organism, such as prevailing climate and soil, but also the other organisms with which it interacts, including its competitors, predators, disease agents, and, in the case of some plants, its pollinators and fruit dispersers. Artificial selection requires a farmer, in addition to natural environmental circumstances, to determine which individuals possess the key characteristics to pass on to the next generation, allowing only the most desirable individuals to breed. The hope is that the particular trait under selection is highly heritable (having a strong genetic, instead of environmental, basis), so that the next generation will have greater expression of the trait than the parent generation did. Plant farmers have iterated this process for over 10,000 years, ever since the earliest farmers took seeds from the juiciest fruit trees and most heavily laden grain stalks and planted them near their homes. In so doing our agricultural forebears domesticated many of their most nutritionally important and delicious wild plant species, changing them over generations into the varieties that modern people recognize as our primary food plants. Farmers choose to breed those individual plants that maximize desirable qualities and minimize undesirable ones. In the domesticated varietal of a wild species the desirable quality under selection, such as the sweetness of fruit or the size of a particular structure, may become amplified over time, exaggerated over the average wild condition. Or a farmer may save from obscurity an individual with a characteristic that is rare in the wild or in the most common farmed variety, such as a particular flower color, or a nontoxic mutant almond, making the unique plant a progenitor of a new varietal. Some species have undergone the domestication process multiple times, and with some of these species, each domestication effort has focused on amplifying different structures of the plant, producing a cornucopia of extraordinarily different vegetables or fruits from the same wild progenitor. Such is the case with Brassica oleracea. The wild plant is a weedy little herb that prefers to grow on limestone outcroppings all around the coastal Mediterranean region. It is a biennial plant that uses food reserves stored over the winter in its rosette of leaves to produce a spike of a few yellow flowers at the end of its second summer before dying. Those nutritious leaves make its domesticated derivatives important food crops in much of the world now. 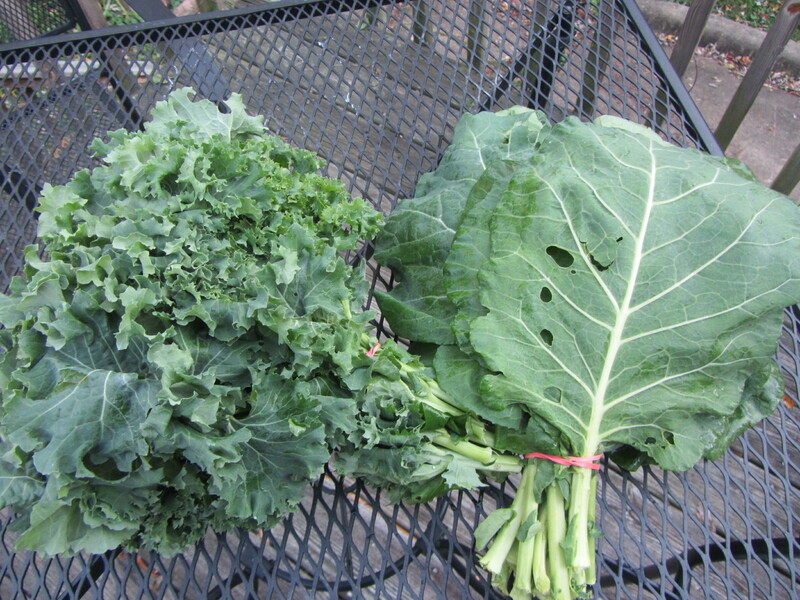 Enterprising farmers over the last several thousand years contributed to domesticating several distinct lineages of B. oleracea, each amplifying different parts of this wild plant to produce several vegetable varieties, or cultivar groups or subspecies (“ssp.”): kale and collard greens (ssp. acephala), Chinese broccoli (ssp. alboglabra), red and green cabbages (ssp. capitata), savoy cabbage (ssp. sabauda) kohlrabi (ssp. gongylodes), Brussels sprouts (ssp. gemmifera), broccoli (ssp. italica), and cauliflower (ssp. botrytis). These varieties look dramatically – sometimes comically – different but are nonetheless considered to be the same species because they are all still interfertile, capable of mating with one another and producing fertile offspring. One can readily observe that these vegetables simply look quite different at first blush, so it is often surprising to people to learn that they are in fact the same species. To understand the domestication details of the B. oleracea cultivars and the structures you are looking at when you see them in the grocery store, you have to understand basic angiosperm (flowering plant) morphology and growth pattern. Important aboveground structures of the plant body are labeled in the schematic diagram of the flowering plant growth pattern below. The relationship between a generic plant body and some vegetable crops. For example, varieties of Brassica oleracea resulted from selection to exaggerate different parts of the original wild plant. Note that this generic plant is not meant to represent any particular species, and that it does not resemble Brassica. Meristem tissue in plants is analogous to stem cell tissue in animals. It is capable of developing into numerous types of plant structures. All plant tissues grow by cell division and originate as meristem tissue. When a meristem cell divides to produce a particular structure, like a leaf or stem, only one of the two daughter cells differentiates to become part of the plant body. This cell may subsequently divide, but it will only make more specialized cells, like leaf or stem cells. The other daughter cell remains meristem tissue. Meristem tissues located in different parts of a growing plant are named for the structures they produce. The shoot meristem, the cluster of meristem cells in the tip of the main stem, gives rise to the initial vegetative (non-reproductive) structures of the growing plant body. Plants have modular construction and grow by iteratively adding successive basic vegetative units. This basic unit of the plant body consists of a stem, a leaf, and a vegetative axillary bud, located between the stem and a leaf’s petiole (the stem-like stalk that attaches the leaf blade to the stem). The point on the stem where the leaf and its associated axillary bud originate is a node. As the plant grows the shoot meristem continues to generate the basic unit, spaced apart on the stem by a specified internode length. The axillary buds themselves contain meristem tissue, called axillary meristem, which can give rise to side branches off the main stem, which themselves will repeat the basic vegetative unit. The early history of B.oleracea domestication is not well known, but it was already well established as a garden vegetable by the time that the ancient Greek Theophrastus (371-287 BC) wrote his Enquiry into Plants, in which he mentions three leafy varieties, such as kale and collard greens, and records the prevailing belief at the time that growing B. oleracea in close proximity to grapes would impart a cabbage flavor to the wine. Domestication increased the size of the leaves of wild B. oleracea to produce kale, collard greens in Europe, and Chinese broccoli in China. These leafy varieties are the most similar to (the “least derived” from) the wild ancestor. Kale and collard greens were likely the progenitor of all the other varieties (Brussels sprouts, cabbage, kohlrabi, and broccoli and cauliflower in Europe; Chinese broccoli in Asia) (Maggioni et al. 2010). Several varietals of kale are becoming increasingly available in markets and vary in color, leaf morphology and texture. 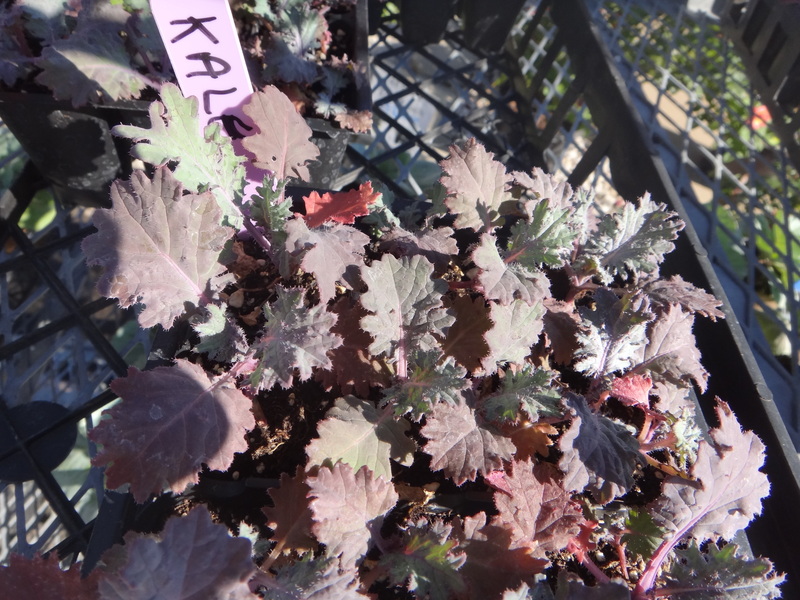 Green curly kale is the most commonly available, followed by lacinato or dinosaur kale, which has dark green dimpled leaves, and purple “red” curly and frilly red and white Russian varieties. Decorative purple, white and green kales are also common autumn garden ornamental plants. 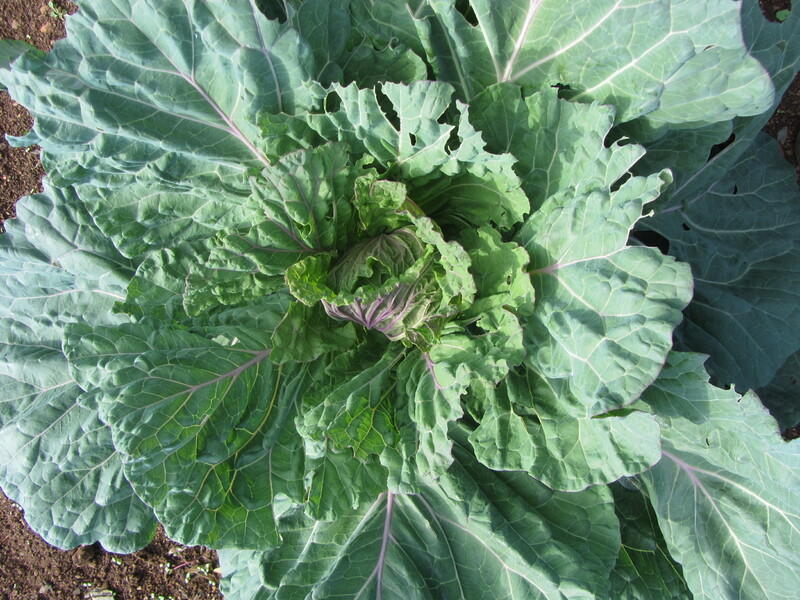 To make the developmental jump from leafy domesticated varieties to headed cabbage, farmers retained the large leaves of the early kale and focused on dramatically reducing the internode length and enlarging the size of the terminal bud. The terminal bud is the cluster of immature leaves arising from the shoot meristem tissue. The cabbage head is an extraordinarily large terminal bud surrounded by large leaves packed very tightly together on the short, fat, stem (the core of the cabbage head, pictured at right). 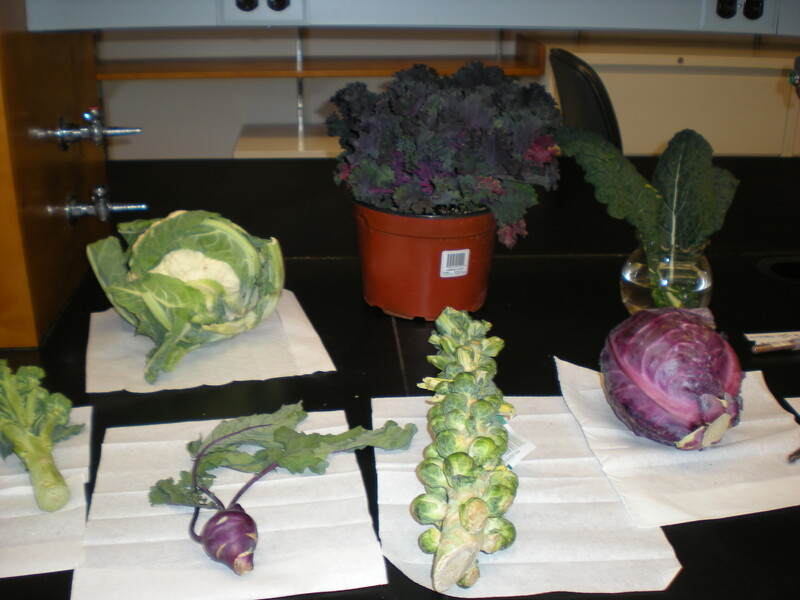 Three distinct varietals of cabbage are recognized: white (B. oleracea ssp. capitata var. alba), red (B. o. c. var. rubra) and savoy (B. oleracea ssp. sabauda), which has a pale green head with dimpled leaves, similar to the texture of lacinato kale. Head cabbage was a recognized domestic vegetable in the Mediterranean by at least the twelfth century. Brussels sprouts were developed by selection to greatly enlarge the axillary buds. You can see this if you ever grow them yourself or can buy them on the stalk when they’re in season in late summer and fall. Usually when you buy Brussels sprouts on the stalk the leaves have been cut off, so you can only see the sprouts themselves arranged in tight spirals around a thick main stem. 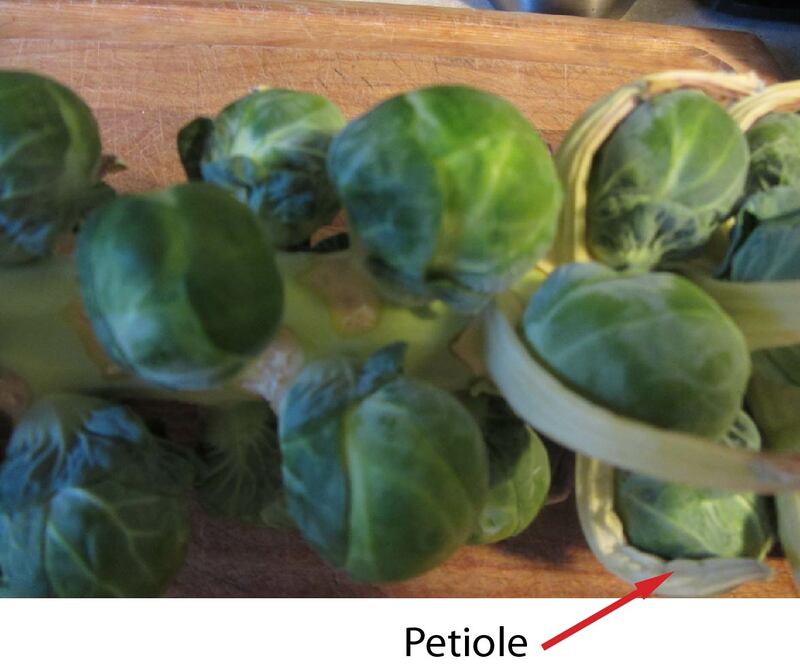 To see that these are axillary buds look for leaf scars or petioles (leaf “stalks”) below each Brussels sprout (see the picture at right with the petiole labeled and pale leaf scar visible below the sprout). The axillary buds are smaller versions of the terminal bud that was enlarged to produce cabbage, which is why Brussels sprouts look like miniature cabbages. Brussels sprouts are harvested when the unfurling leaves are still tightly wrapped in the bud. If left to develop, they would develop into short thick branches. If you slice a Brussels sprout down the middle you’ll see a short fat little stem like a cabbage core, and if you look very closely between this little stem and the leaves unfurling from its tightly packed little nodes, you’ll see adorable little axillary buds. These little axillary buds are still visible, by they way, after the sliced Brussels sprouts have been braised in a little stock and tossed with brown butter in which you have popped brown mustard seeds (another Brassica species and the subject of an upcoming post) – just in case you want to impress your friends at dinner with your amazing botanical knowledge. The Brussels sprout is popular in its Belgian namesake and may have been developed there around the 13th century. Meristem tissue is also located in the sides of stems, in addition to in the terminal and axillary buds. This lateral meristem tissue is what allows the stem to grow outwards, not just upwards, to support the growing plant. 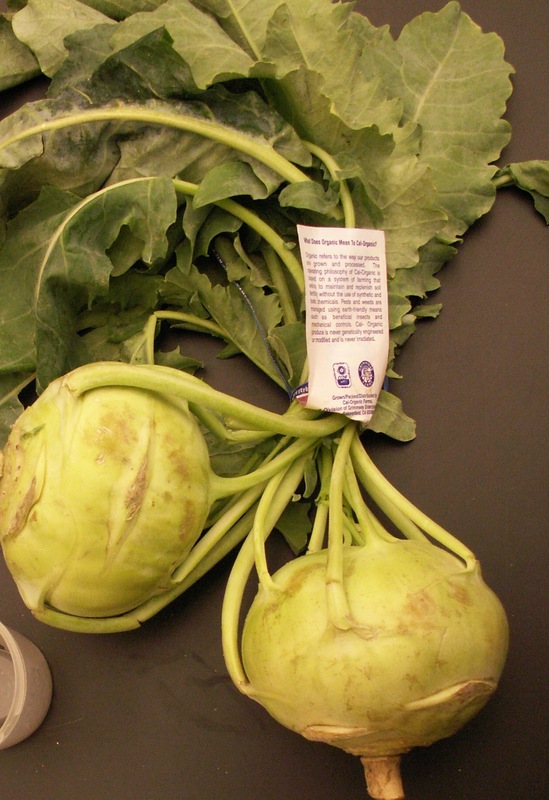 To understand the morphological origins of kohlrabi, you can start by imagining kale and thinking through the changes required to transmogrify it into kohlrabi. When you buy kale in the store, it usually comes in a bundle of leaves, all cut from the main stem from which they grew, so you might never have contemplated the main stalk of the kale plant. This main stem is not as thick as the cabbage core, but it still can be substantial (see the stem in the Brussels sprouts images above). This fleshy, edible stem is packed with parenchyma cells. Parenchyma cells store nutrients and chemicals synthesized by the plants and provide structural support. New parenchyma cells originate from–you guessed it–parenchyma meristem in the stem. Now imagine the parenchyma tissue in this main axis proliferating, allowing massive expansion of the radius of the base of main stem, morphing the stem into a thick, squat bulb. That is the domestication history of kohlrabi, recorded in Europe since the 15th century (Vaughan and Geissler 2009). 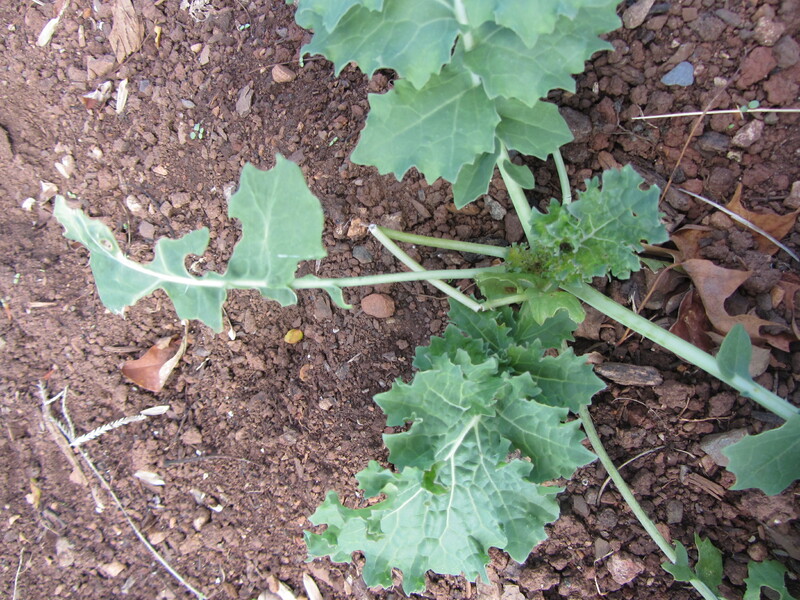 The leaves are often cut off in kohlrabi at the grocery store, just leaving little spikes of petiole, but if they are left on, you can immediately see (and taste) the similarity to collard green leaves. The skin on the kohlrabi is tough – sometimes the lateral meristem has produced a thin layer of wood – and it should usually be peeled off. Then you can either thinly slice the kohlrabi into rounds or julienne slice it to enjoy it fresh, or you can cube it and roast or steam it and dress it however you’d like. Julienne-cut fresh kohlrabi is great combined with similarly cut fresh apple or pear and onion and tossed with a mustard vinaigrette into a unique slaw. The big-headed broccoli most commonly grown in the United States is only one of the dizzying number of varieties of broccoli to be found in Italy, where the earliest written records of the vegetable date to the 16th century (Gray 1982). Cauliflower is likely derived from one of these Italian varieties of broccoli (Gray 1982). Broccoli and cauliflower are notable for exceptionally large inflorescences (flower clusters), arranged in branched florets atop its thick (edible) main inflorescence stem rising out of the rosette of large basal leaves typical of the species. See the picture at right of the broccoli plant with the main inflorescence (broccoli head) cut off. You can see the big basal leaves that look very much like collard greens and small lateral broccoli florets branching off from the cut main stem. Those large, typically tougher basal leaves of all of these B. oleracea varietals are completely edible. They will soften with a long braise. A delicious Thai appetizer, however, uses raw broccoli leaves as the substrate for a tasty wrap! The inflorescence is usually harvested before the flower buds mature and open into the little yellow flowers typical of the species. 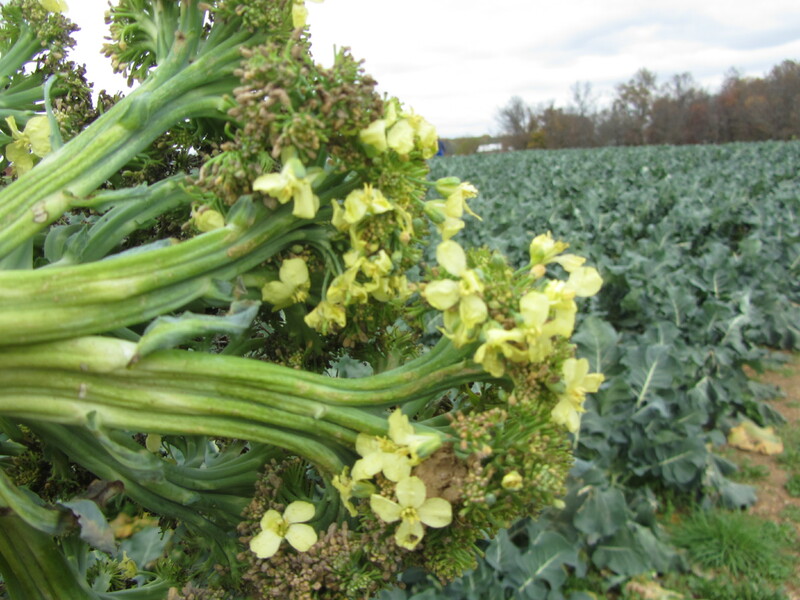 A blooming piece of broccoli inflorescence gone well past harvest condition from a broccoli field is pictured at left. Notice the similarity of the flowers to the flowers of the wild yellow mustard above. Sometimes bunches of broccoli left too long in the fridge will open a few flowers. 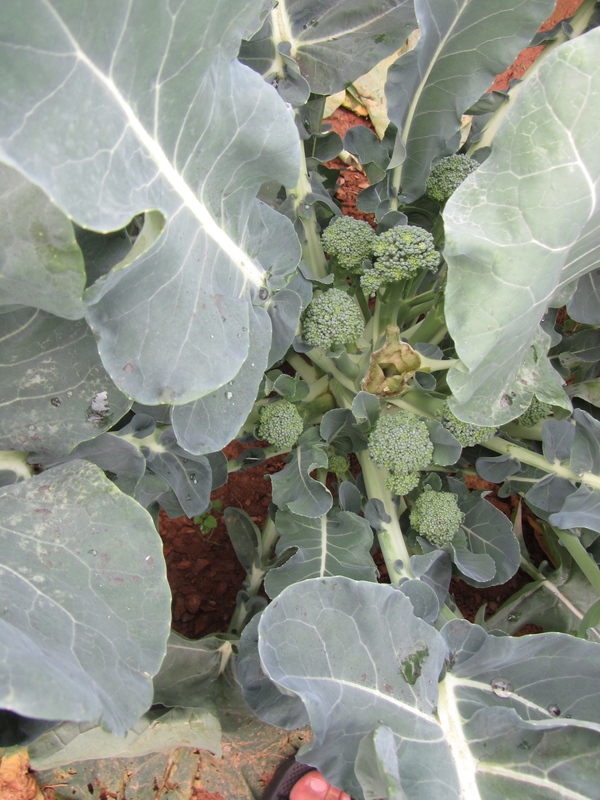 The path from wild B. oleracea to broccoli and cauliflower required modifications to the timing and location of the transition from vegetative growth to reproductive development. Forming reproductive structures (flowers, fruits, seeds) on a particular stem requires two meristem transformations, pictured on the schematic diagram above. First, shoot meristem becomes inflorescence meristem, which produces the stem structure supporting the flowers. This flower-supporting stem, which may be highly branched, is the inflorescence. To actually get flowers atop an inflorescence, inflorescence meristem must become floral meristem, which forms flower structures. The tight, bumpy white “curd” forming a cauliflower head results from extensive proliferation of many mutant inflorescence meristems on top of the initial inflorescence branches that become arrested at the inflorescence meristem stage. They never elongate into more inflorescence or produce floral meristem. 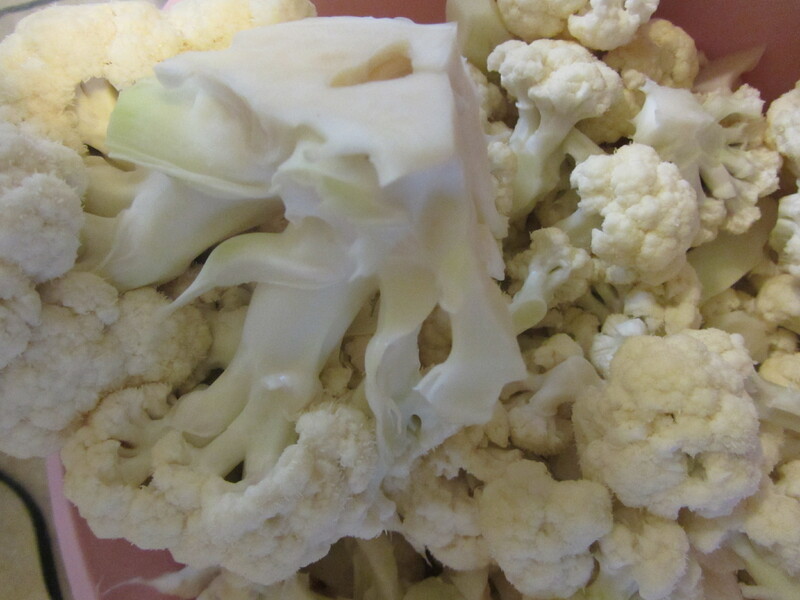 If cauliflower is left to develop instead of being picked when the curd is at its most dense, as is preferable in the kitchen, the curd would loosen and about 10% of the inflorescence meristem would go on to produce floral meristem and finally flowers, which is why we have cauliflower seeds at all. Broccoli shares inflorescence meristem proliferation followed by arrested inflorescence development with cauliflower, although broccoli’s inflorescence meristems do go on to produce floral meristem and initiate floral development before further expansion of the inflorescence ceases. The genetic mutations that led to the broccoli and cauliflower inflorescence type is fairly well understood and will be explained in a future post. 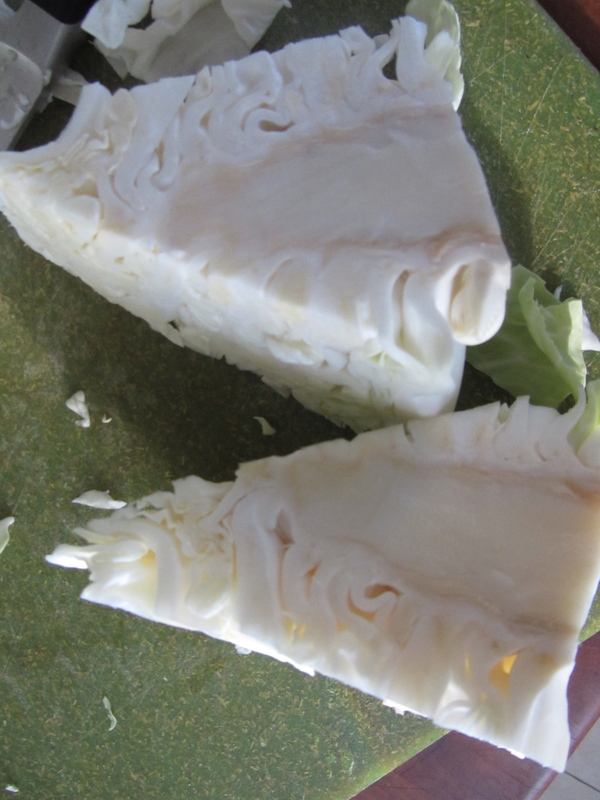 Cauliflower heads are white, by the way, because of blanching by the large basal leaves wrapping around the curd on their own or with the guidance of a diligent farmer. If the heads aren’t blanched they will develop a pale greenish yellow color and might be more bitter. Hybrids, the outcome of interbreeding between two species or cultivar groups, between these completely interfertile varietals produce vegetables with characteristics intermediate between their parent varietals. Some of these hybrids are gaining in popularity. Broccolini is a hybrid between the Italica and Alboglabra cultivar groups. Broccoflower, a green cauliflower, and other colorful cauliflower-like vegetables, are hybrids between the Italica and Botrytis groups. Broccoli rabe, or rapini, is actually a varietal of another species, Brassica rapa, to be discussed in another post. Note that these several varietals were largely produced by modifications to non-reproductive structures. 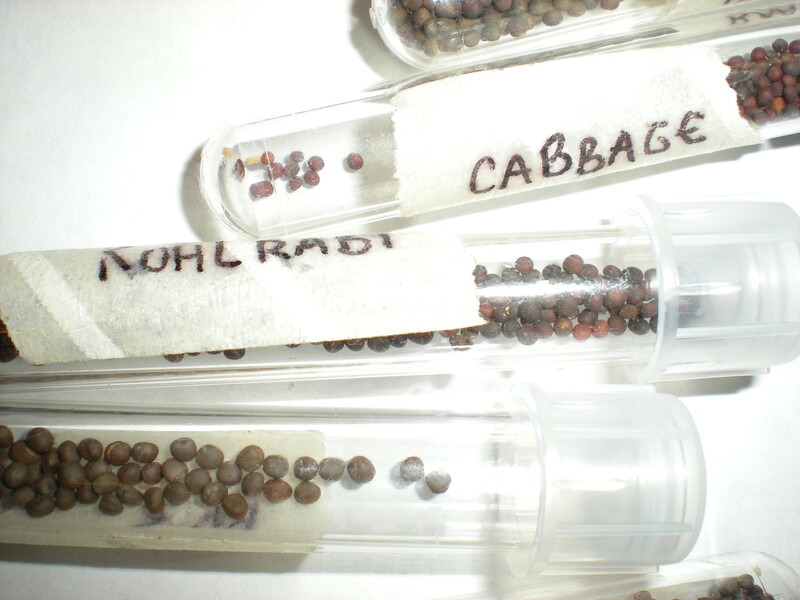 Even in broccoli and cauliflower, the plant breeders ignored the fruits and seeds of B. oleracea during domestication, and these structures are indistinguishable among the several vegetables (seeds in vials pictured at right). 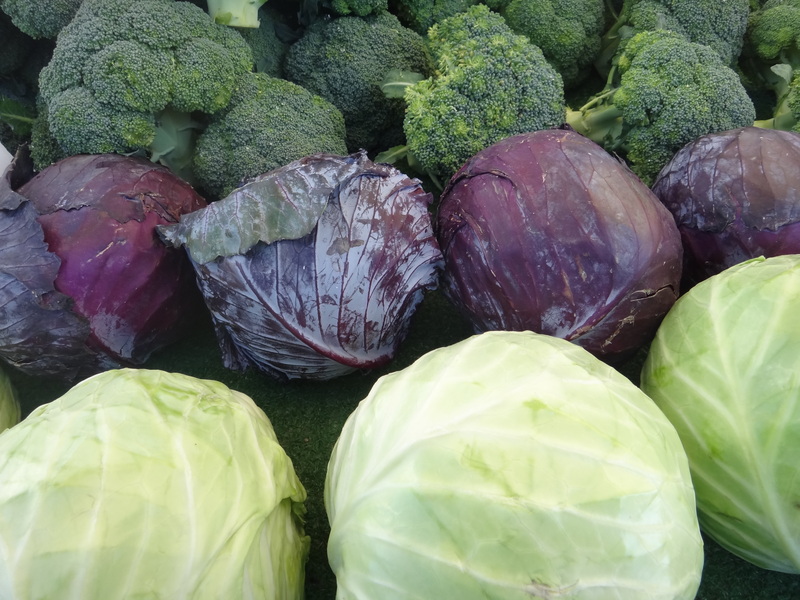 Purple-tinged, bumpy leaf texture, and numerous green varieties have been developed of most of these B. oleracea vegetables, reflecting broad genetic variation in this constellation of plants that have been collectively undergoing domestication for millennia. All of these varietals have retained the cold-hardiness that helps the wild B. oleracea face frosty falls, a characteristic that undoubtedly contributed to their popularity in the cooler regions of first their native Europe and later the rest of the globe. Cruciferous vegetable enthusiasts in cool temperate regions welcome the increased sweetness of these vegetables as frost approaches in late summer and autumn. Increasing the sugar concentration of tissues is actually part of the anti-freeze system of many plants, which is switched on as temperatures fall and allows them to continue to grow or mature seeds for a while in the face of frost and prepare for winter dormancy. Enjoy the distinctive sweetness of the crucifers this fall. I hope the caterpillars did. 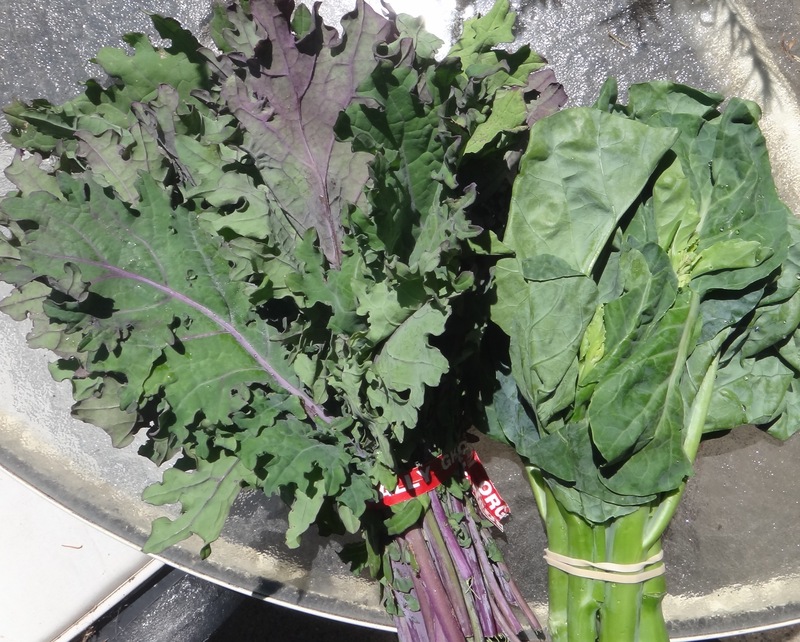 Update (8 April 2013): Some kales, including Red Russian kale, are actually “Siberian kales,” species Brassica napus, the same species as rutabaga, instead of B. oleracea. Gray, A. R. 1982. 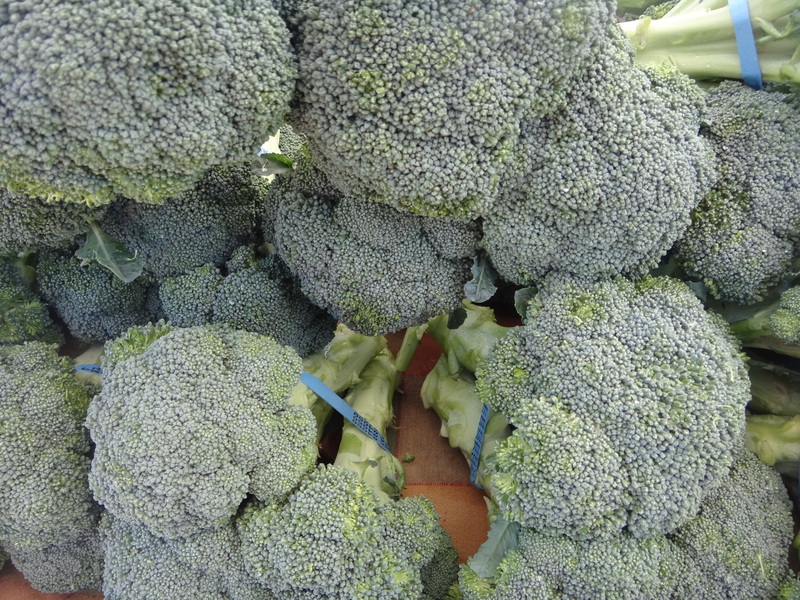 Taxonomy and evolution of broccoli (Brassica oleracea var. italic). Economic Botany 36(4): 397-410. Maggioni, L., R. von Bothmer, G. Poulsen, and F. Branca. 2010. Origin and domestication of cole crops (Brassica oleracea L.): linguistic and literary considerations. Economic Botany 64(2): 109-123. Singer, S., S. Deel, and D. Walser-Kuntz. “Reconstructing the Evolution of Cauliflower and Broccoli.” Carleton College. 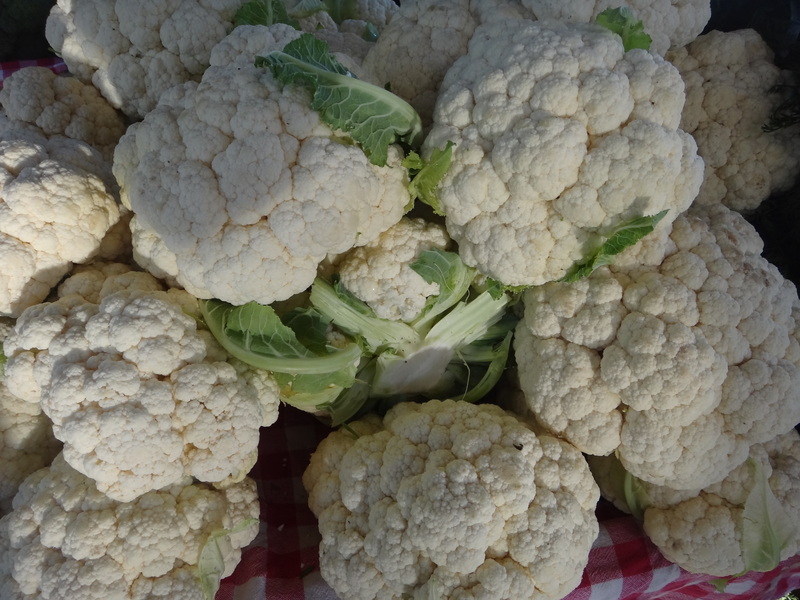 http://serc.carleton.edu/genomics/units/cauliflower.html. Vaughan, J. G., and A. Geissler. 2009. The New Oxford Book of Food Plants. Oxford University Press, New York. This entry was posted in The basics and tagged angiosperm, artificial selection, Brassica, Brassica oleracea, Brassicaceae, Brassicales, broccoli, Brussels sprouts, cabbage, cauliflower, Chinese broccoli, collard greens, crucifer, eudicot, Jeanne L. D. Osnas, kale, kohlrabi, mustard family, Pieris rapae, vegetable, white cabbage butterfly. Bookmark the permalink. This is my first encounter with your blog and I enjoyed it thoroughly. As a chemist, I appreciated the degree of detail and I look forward to reading more articles. Utterly fascinating, thank you. I appreciate the detail, the science is a bit beyond me, but so well explained I managed to follow along. I am fairly obsessed with crucifers from a nutrition point of view and have to eat kale, brocc and cauli on a daily basis or I dont feel quite right. The history of their wildness and domestication is fascinating! I was introduced to wild kale self-seeding freely along a river path that is untouched by cultivation of any kind. In spring, the leaves can be foraged and while much smaller than cultivars are delicious and free! I am into cavalo nero too, so inky black it must hold amazing benefit and with a fantastic leaf texture. What a great article! As a botany geek, I loved getting the detail on exactly how all these different veggies were bred from a single plant. Your writing is very engaging and entertaining. Loved this, and learned so much! I was researching information for a much more cheeky blog version on describing this same principle, and just had to link to this amazing article once I found it. Thanks. Great piece! Thank you for not diluting the terminology…it was great to use my plant biology knowledge while reading. Thank you! Our goal is to use the correct terminology but to explain it well enough so that is it generally understandable and interesting. Glad to know it’s working for you! Nicely presented and informative. It’s fun to learn the history of gardening and our love affair with beneficial plants and I have the feeling there are plants with undiscovered treasures out there.